Strong suggestion: Use the CalcCowID button to Calculate the Cowordinates and ID of every logic you put into a Custom Level! You won't regret the time spent when you add your first SecretTeleporterTrigger. It is used to associate an object (Trigger) with another object (Switch) controlling the usage of the object. Dialog Box (minimal Giant Rock example). The names of these fields have little to do with the game of Gruntz! 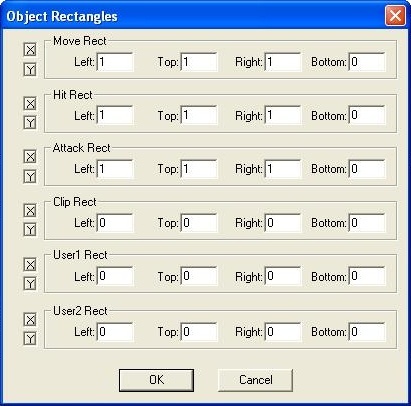 Apparently, the game engine is generic, and these field names are meant to have meaning for the game the engine was originally designed to control. There are some Gruntz logics that look for their additional information in certain of these fields, but TileTrigger does not seem to be one of them. (Intelligent design!) So any one of the 24 fields may be used. Strong suggestion: start at the top (Move Rect), Left:,Top:,Right:,Bottom:, down to Hit Rect (Left:) and work your way to the bottom (User2) when entering Switch IDs. Find the 'address' of the Switch meant to control the object, and place that 'address' into one of the Rects: fields. (Please follow the suggestion ... you won't regret it.) If more than one Switch may affect the object, just keep adding Switch IDs into the next available Rects: field. Special note: It is only necessary for a single Red Pyramid or to have Switch IDz associated with it ... but it must have the IDz of all of the Red Toggle Switchez and/or Red Hold Switchez !